Flaming Pines label founder Kate Carr has developed a highly regarded and multi-faceted creative practice “centered on articulating the relationship between people and place through sound”. In addition to her own sound work, she has curated a variety of wonderful conceptual series, the latest of which has seemingly unlimited potential despite its ostensibly diminutive name – Tiny Portraits. Zenjungle is the musical alias of musician and artist Phil Gardelis based in Athens, Greece. He has been quite busy of late, with a number of solo albums & EPs, collaborations, not to mention his graphic art which includes logos and album covers. 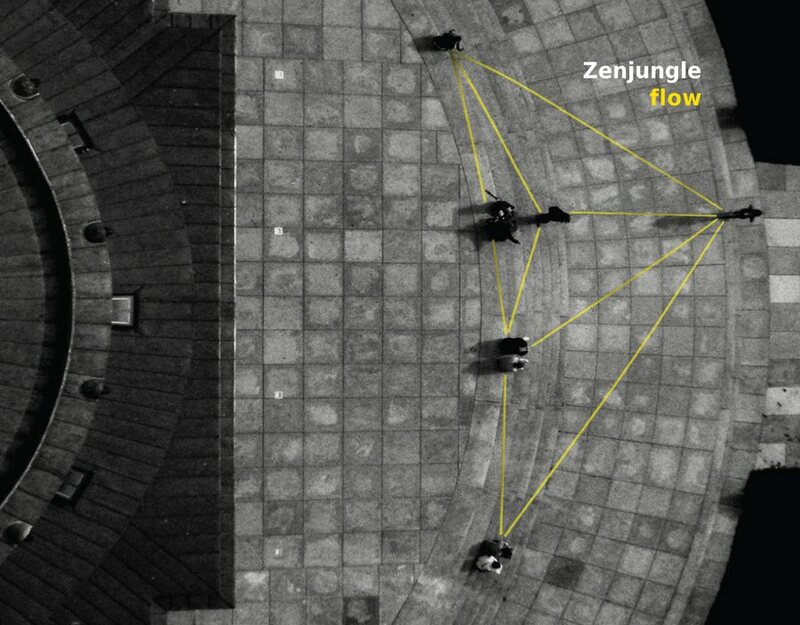 The most recent musical release is Flow, a four track sonic journey on German label Midira Records. 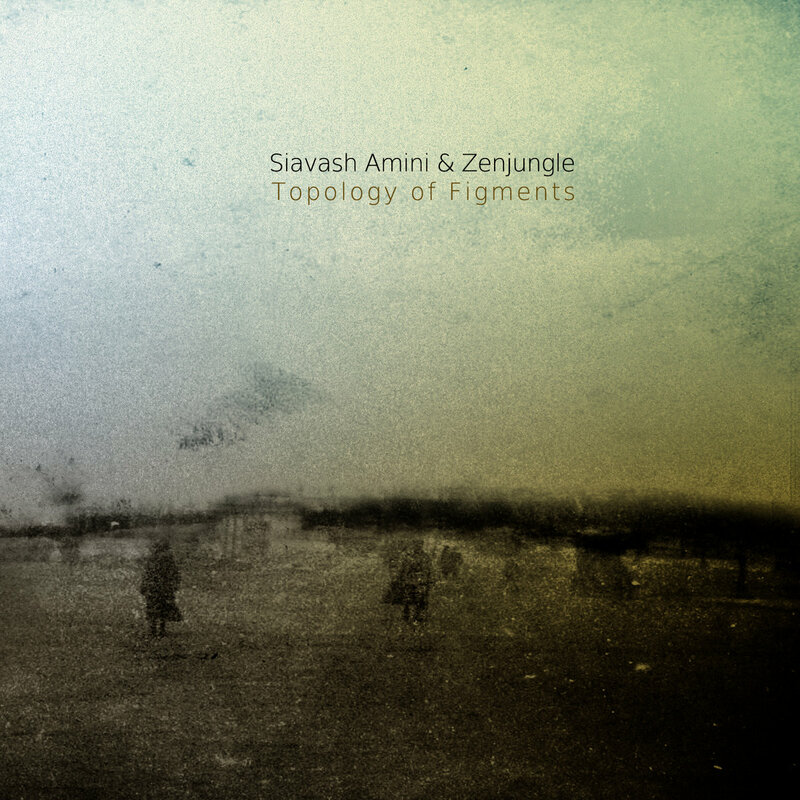 The cover art with its austere geometric concrete imagery, designed by Gardelis himself, is emblematic of the music contained within which brings together deeply atmospheric drones, heavily textural ambient guitar, and the most distinctive aspect of the Zenjungle sound – the saxophone. Noteworthy highlights from the past week of music discovery, releases, previews, and other news. Remember daily updates are available on the ST Facebook and Twitter feeds and audio/video links to all tracks featured during the month are available on our Songdrop page. Phil Gardelis from Athens Greece and John Daly from Ballinafad, Ireland have produced a new collaboration called Tales From Urban under their respective monikers Zenjungle and Tunedin52. The pieces are centered around Gardelis’s saxophone and Daly’s guitar, but both musicians contribute a plethora of other elements to create a moody experimental journey that straddles the ambient and the avant garde with a slightly noir feel. An intriguing listen. I was especially enamored with the closing track featured below. Bosques de mi Mente is the solo project of Ignacio Nieto Carvajal based in Madrid, Spain. Sadly, Carvajal has announced the closing of the project citing a particularly disillusioning experience with inappropriate use of his material and released No Sobreviviremos Otro Invierno as its “swan song”. Whatever the future holds for Carvajal and his project, there is no denying the minimalistic beauty of these pieces centered around the piano and cello. Immersion / Drift/ Accretion / Shift is one of two new releases out on the amazing Eilean Records label. This album is by BMRN, the solo project of beatmaker, producer and experimental musician Greig Baird from UK. It is a mesmerizing fusion of elements drawn from hiphop, electronic music, drone and ambient rooted in found sounds and field recordings. ‘Shoreline Flights’ is a particularly absorbing track. Each Eilean release features stunning artwork and the cover for this one is from photographer Peter Nejedly. 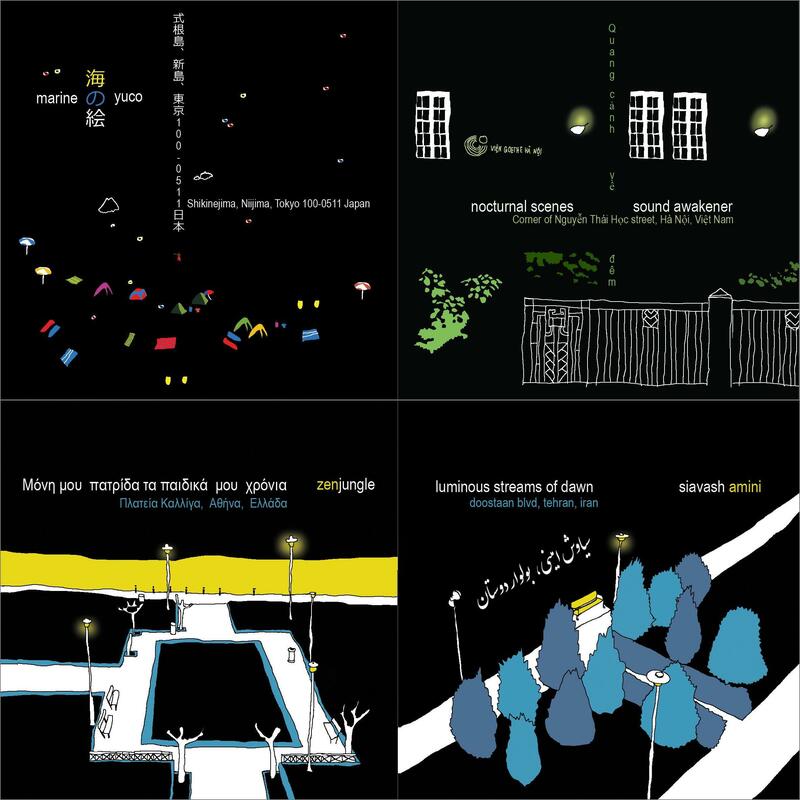 The second of the Eilean Records releases this week is from vhr-1.7, a new project from Komatsu Kei, a sound designer and musician from Japan based in Tokyo. This album is a collection of exquisitely crafted abstract soundscapes with a variety of noises and textures bedded into soft ambient drones. Cover art is by Tatiana Plakhova (Complexity Graphics). Water Garden is a release due out later this month from Unknown Tone Records. It is an ambient collaboration of Darren McClure, originally from Northern Ireland and currently based in Matsumoto, Japan, and Miguel Isaza, a composer from Medellin, Colombia. The organic beauty and captivating textures of the preview track ‘Breathe’ and the striking cover painting by Jeff Hogue have planted this album prominently on my radar. I was tipped off to this project by a tweet from Rasa Daukus of the modern classical duo Tess Said So. Wood Works is an album due out in September from The Danish String Quartet. The article linked below is well worth reading, but the short of it is that this album represents a fresh & beautiful take on Scandinavian folk music recorded last year at the Kirsten Kjærs Museum in Northern Jutland. The music is stunningly gorgeous and I was quite hooked just seconds into the 2 minute video preview below. I suspect you will be as well. For a while now I have been sharing links from a very cool project by composer and trad musician Mike Vass. Called ‘In the Wake of Neil Gunn’, it is not only a music project, but a very real journey. The first phase, which involved a boat voyage around the Western Isles of Scotland mirroring the one chronicled by the author in his 1937 book Off In A Boat. That mirror voyage, which included musical performances at various ports along the way, can be followed on the blog linked below. The next phase is the release of a new album of music inspired by the experience and that will be coming out in October on Unroofed Records. This week the first preview track, ‘Settled in Clay’ was revealed and is as lovely as I had hoped it would be. Instrumental ensemble Balmorhea is releasing their first new music since 2012 via Western Vinyl. Heir will be a two track album along with bonus material to be pressed on 7” vinyl. ‘Heir 1’ is available now to be streamed on Soundcloud and heralds a delightful return to the airy, melancholy-tinged blend of acoustic, electronic, and classical elements for which they are known & appreciated. Fans will not want to miss this and if you don’t know Balmorhea’s music, this would be a fine place to start. Kiasmos, the electronic music project of Olafur Arnalds and Janus Rasmussen, will be releasing their much anticipated full length album on Erased Tapes in October. The band’s Facebook profile explains what has been going on in the past year leading up to this: “After dropping several tracks and performing at select festivals throughout the years, Ólafur Arnalds and Janus Rasmussen dedicated the year 2014 to explore the area in-between Ólafur’s more acoustic, piano-based solo work and Janus’s synth-heavy electro pop, with their collaborative electronic project Kiasmos.” . The excitement over this release has been amped up further by the debut of the stunning track ‘Burnt’ on the Erased Tapes Soundcloud page. Pure headphone candy.